November 15, 2010: 17 leading arms control experts (who served under Carter, Reagan Clinton & both Bush administrations) urge President Obama not to allow U.S. taxpayer loan guarantees for Electricite de France and Calvert Cliffs-3 unless France changes its non-proliferation policies. November 4, 2010. The EPR in Crisis. A new report from Steve Thomas of University of Greenwich concludes that EDF/Areva should abandon the EPR reactor design because of its extraordinary costs. October 14, 2010: After Calvert Cliffs Collapse: Two remaining top loan guarantee applicants seen as untenable. South Texas Project and V.C. Summer Reactor Trapped by Same “Powerful Undertow” of Unfavorable Economics, Cheap Natural Gas, Slumping Demand and Runaway Construction Costs That Caused the Collapse of Calvert Cliffs-3. Press release from 10/14/10 press conference. You can listen to streaming audio of the press conference here. October 9, 2010. Victory at Calvert Cliffs! NIRS statement on Constellation Energy's decision to end participation in Calvert Cliffs-3 reactor project. September 15, 2010. 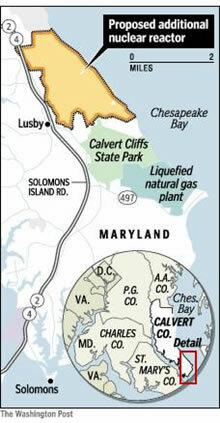 “The nuclear “renaissance” stalls with pending collapse of proposed Calvert Cliffs-3 reactor in Maryland,” article by NIRS executive director Michael Mariotte (updated and condensed from August 5, 2010 posting on DailyKos). August 25, 2010. Letter from Chesapeake Safe Energy Coalition to Rep. Steny Hoyer detailing current problems with proposed Calvert Cliffs-3 reactor and describing support for it as ill-advised. June 25, 2010. Intervenors submit new contention in Calvert Cliffs-3 hearing, based on inadequate and faulty analysis of need for power, consideration of alternative energy sources, and costs. 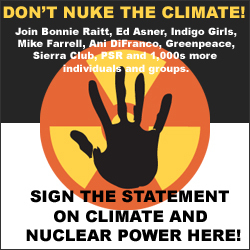 Express your organization's opposition to the construction of a new nuclear reactor in Maryland. Download and Sign the Statement here. Chesapeake Safe Energy Coalition exists to challenge and subsequently stop the proposed new reactor at Calvert Cliffs.